Cold Spring Harbor, NY – Like pancreatic cancer, cancer of the ovaries is notorious for being discovered at a relatively late stage—after it has spread to other sites in the body. It is not called “the silent killer” for nothing. Fully two-thirds of women who are diagnosed find out at Stage 3 or later, once metastasis has begun. Fewer than 25% of such women survive 5 years—while the corresponding figure for those fortunate enough to be diagnosed at Stages 1 and 2, when the cancer is still localized, is between 70% and 90%. Today, a team of researchers at Cold Spring Harbor Laboratory reports in the journal Genes & Development that they have arrived at “new insights into signaling events that underlie metastasis in ovarian cancer cells,” says Gaofeng Fan, Ph.D., postdoctoral investigator who conducted most of the experiments, in the laboratory of his mentor, CSHL Professor Nicholas K. Tonks. A previously undiscovered pathway through which ovarian cells can be transformed into cancer cells. The key is a protein called FER, which can be found floating in the cell cytoplasm. CSHL scientists demonstrated that it is both overproduced in ovarian cancer cells, and, importantly, responsible for the elevated motility (ability to move) and invasiveness of such cells. This was observed in human ovarian cancer cells grown in culture and then in mouse models of the disease. Above, the team shows what happens when FER is rendered inactive in various kinds of ovarian cancer cells grown in culture. The left panel (A) shows motility; the right panel (B) invasiveness. FER is active in the control cells, top row, (A) and (B); FER is inactive in the corresponding cells in the bottom row, (A) and (B). 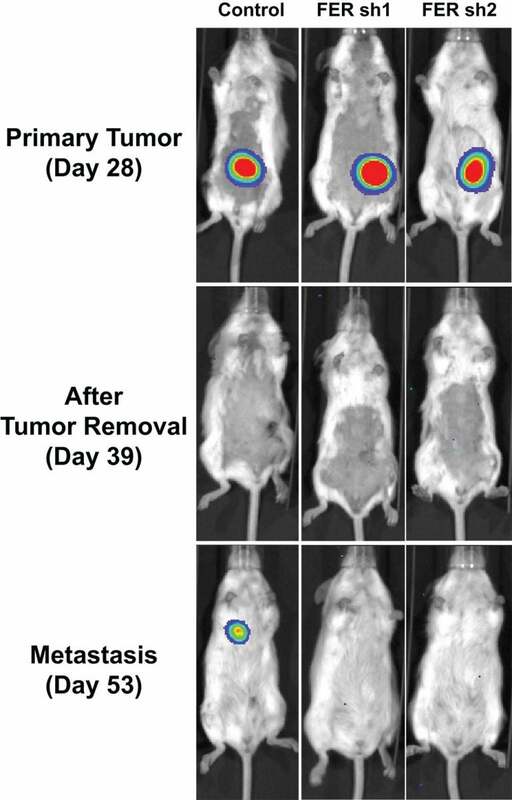 Experiments in mice showed that FER helps to promote metastasis in ovarian cancer. Three mice with similar primary ovarian tumors are shown prior to surgery (top row) and following surgery (middle and bottom rows). 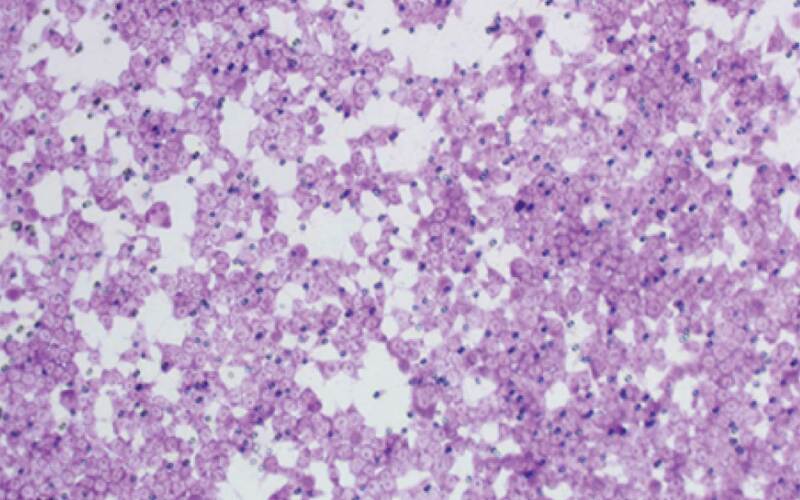 A metastasis of the primary tumor appears in a lung of the mouse in the left column. FER was active in this mouse. The other two mice, in which FER has been inactivated genetically, remain cancer-free at the same time point following removal of the primary tumor. The newly uncovered pathway depends on activity of a protein called FER, a member of a family of proteins (called non-receptor tyrosine kinases) that add phosphate groups to other proteins. 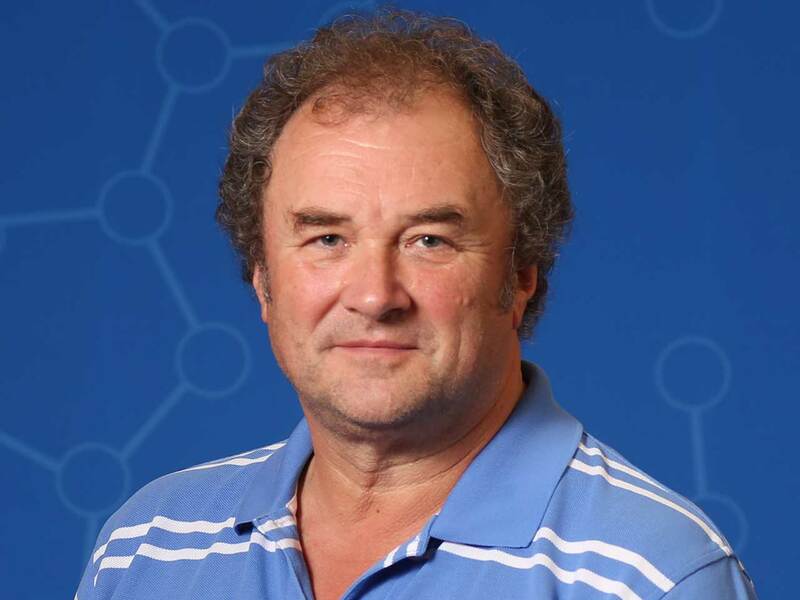 FER can be found floating in the cytoplasm of cells, and in a series of initial experiments, Fan and the team demonstrated that it is both “upregulated,” i.e., overproduced, in ovarian cancer cells, and, importantly, responsible for the elevated motility and invasiveness of such cells. This was observed in human ovarian cancer cells grown in culture, and then in mouse models of the disease. The key discovery made by the CSHL team is that FER is able to activate a receptor on the surface of ovarian cells “from below,” as it were—by interacting with a portion of the receptor that penetrates the cell membrane and plunges into the cytoplasm. That receptor is a well known target in ovarian cancer. 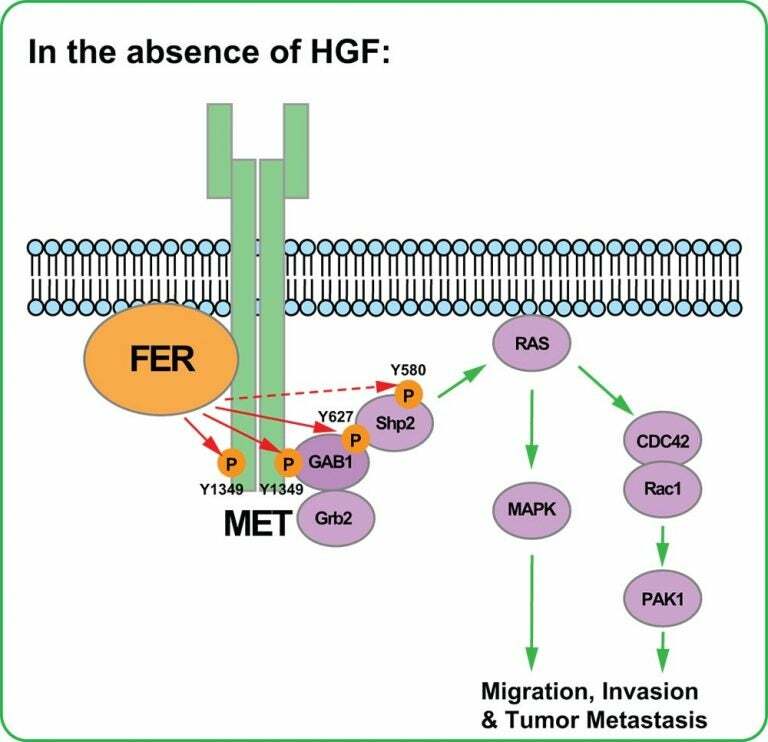 Called MET, it is typically activated when a growth factor called HGF binds it at the cell surface. MET is overexpressed in up to 60% of ovarian tumors and its activation has been implicated in both cancer initiation and in advanced cancers with poor prognosis. Unsurprisingly, then, MET is the target of a number of drug development efforts, which have in common the aim of blocking MET’s activation. So far, candidate MET inhibitors have had weak anti-tumor effects, when administered alone. “It seems ovarian cancer cells are finding other ways to activate pro-cancer signaling ‘downstream’ of MET,” Fan says. The significance of Fan and Tonks’ research on FER is their discovery of how FER activates MET from below, i.e., in the absence of a growth factor docking at the receptor surface. They call this form of activation “non-ligand-dependent,” and in a complex series of biochemical and animal experiments, traced the pathway through which FER’s binding to MET inside the cell sets off a cascade of cell-signaling events, all directly connected in prior research with cancer initiation, including RAC1/PAK1 and SHP2-ERK. FER activates a receptor called MET from below, i.e., in the absence of a growth factor like HGF docking at the receptor surface. MET is often overexpressed in aggressive ovarian cancers. Drs. Fan and Tonks call this form of activation “non-ligand-dependent,” and in a complex series of biochemical and animal experiments, traced the pathway through which FER’s binding to MET inside the cell sets off a cascade of cell-signaling events, all directly connected in prior research with cancer initiation. this suggests the potential utility of a drug blocking or inactivating FER. By setting off these oncogenic cascades, FER, simply by adding a phosphate to the MET receptor, itself becomes a potentially attractive drug target. This is especially so since in animal models of ovarian cancer, Fan and the team demonstrated that FER’s suppression reduced cancer cell motility and sharply reduced metastasis.